Our cruising area is as vast as it is magnificent. The protected water ways, innumerable islands, bays and anchorages extend from south of Seattle all the way through western British Columbia and on to Glacier Bay in Southeast Alaska. You can choose to enjoy the many waterfront resorts, the amenities and attractions of the seaside towns and cities, or simply find your way to remote anchorages and deserted islands. 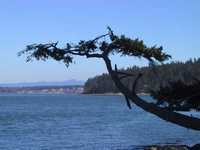 Depart from Anacortes and head for Sucia Island Marine Park. Plentiful, safe anchorage is to be had in Echo Bay. Ashore there are hiking trails and beachcombing. Nanaimo via Bedwell Harbour at South Pender Island to check into Customs. 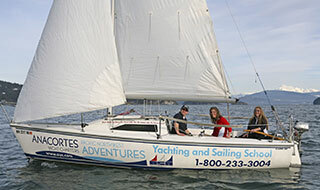 The day's cruise takes you through the Canadian Gulf Islands to Nanaimo. 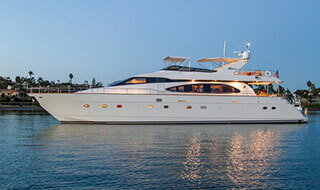 Nanaimo is replete with marine services and yacht provisioning as well as fine restaurants. With an eye to the weather, you are off to an early departure across the Straits of Georgia to Egmont. Moorage is available at the government float or the marina. Take a hike to nearby Sechelt rapids where the current can run 14 knots. Chart a course for a journey up Jervis Inlet to Chatterbox Falls. This cruise is one reason why the Pacific Northwest is irresistible. The 120-foot waterfall against the granite peaks is a photographers delight. The adventuresome head to shore for a bracing dip in one of the pools under the falls. This quaint marina tucked into the sunshine coast is a good place to restock for the journey to Desolation Sound and enjoy a great pizza. There is even a scenic 18-hole golf course nearby. 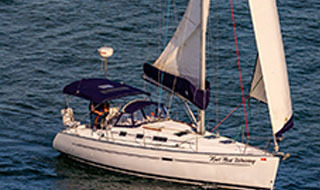 Plentiful anchorage and public docks are set in a beautiful harbour. Arrive in the early afternoon and enjoy a swim in waters that can exceed 70° F during the summer. A protected anchorage with many islets along the north shore. There is also a marina resort with everything from mountain bike and kayak rentals to an excellent restaurant. Leave early and take the long way, or take the short way to get set up in a small cove or off a deserted islet. The area is rich with oysters found on the warm beaches. Sunrise is over 5000 foot granite peaks. This marine park is a beautiful protected spot. This is also the place to find Native American artifacts and petroglyphs. Exercise care in anchoring to the rocky bottom. 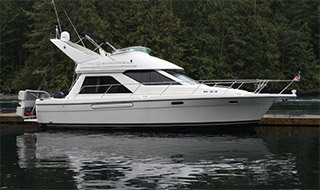 This favorite spot on the Sunshine Coast has ample anchorage and moorage and a variety of coves and inlets. Shore side there are places to re-provision and a few warm and friendly pubs. Plan your crossing of the Georgia Strait with ample time to arrive at this popular spot. Nearby resorts host pig-roast barbeques and flotilla rendezvous. An easy cruise south to this beautiful anchorage. The inlets facing the Northwest are for connoisseurs of sunsets. After stopping at U.S. customs in Roche Harbor, meander through the San Juans to historical Rosario Resort on Orcas Island. Ashore you can enjoy the European spa or the piano bar. An early departure provides an easy trip through Obstruction Pass and return to Anacortes. Take some time to get your land legs back in historic downtown Anacortes and begin to make plans for next year.